Estimated Operating costs for 2018/2019 school year are $668,000. Most of the operating costs are comprise of salaries, which are heavily subsidized by the Government. 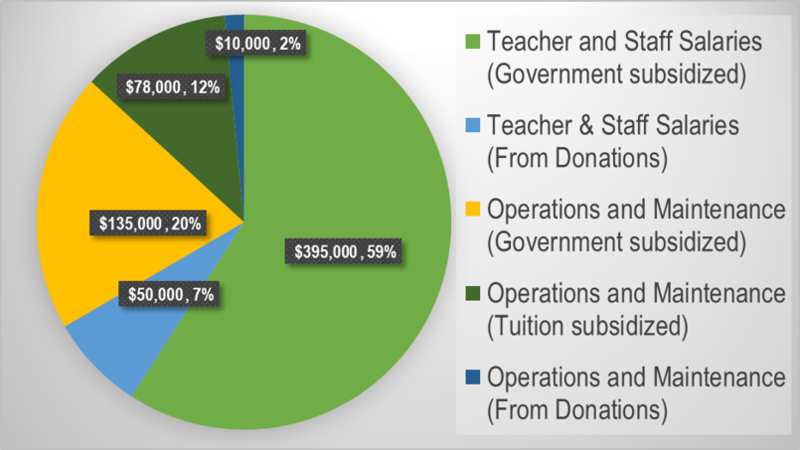 9% or $60,000 of the Budget is needed to be raised from donations to Talsi Christian School Foundation. Current legislation governs that «money follows the student», regardless of the student attending a private or public school. TCS has benefited from this legislation, however there is an initiative in the parliament now which would require that class sizes meet a minimum student count, before money will follow for teachers salaries. This would be detrimental to TCS, as our classrooms are smaller than public schools. Please join us in praying that the legislation is not passed and that the new elections (Oct 6,2018) would bring a majority party favoring private education establishments. If the subsidy is taken away, Talsi Christian School Foundation would have to raise close to $450,000 in teacher’s salaries to keep the school open. TCS charges a EUR 30 tuition ($35) to help cover some of the costs. However because TCS is situated in a rural part of Latvia, this amount of money is a sacrifice for all parents. The average salary in Talsi region is about EUR 750 ($870) although cost of living in Latvia is only about 37% lower than the United States. For parents the tuition is a sacrifice and a form of financial discipline to send their child to TCS. • 9% or $60,000 of the Budget is funded by your giving to Talsi Christian School Foundation and we pray you continue to give in 2018 and 2019. • There are many families who send more than one child to TCS, so TCS Leadership reach out to Talsi Christian School Foundation for scholarships, which come from the donations given by faithful givers to TCS. • Today TCS is debt free because of your faithful giving in the past.